Full content file comparison is a powerful feature, but it can take a long time, especially when comparing large directories with many files. Parallel Full Comparison in the next version of ExamDiff Pro will address this issue. With this new feature, ExamDiff Pro first displays metadata comparison results (time, size, CRC, or any other quick comparison options under Options | Directory Compare | Comparison Precision), then begins to perform full file comparison in a background task. The results are prioritized by files' visibility in the comparison window, enabling you to view already-compared files and use other features of ExamDiff Pro while the full comparison runs in the background, with new results quickly appearing as you scroll to a new area. You can stop full file comparison while it is in progress simply by pressing the ESC key. This feature can be toggled in Options | Directory Compare | Other, under Misc, highlighted below. The two animated images below demonstrate the comparison of two large directories with and without parallel full comparison. The first image, with Parallel Full Comparison disabled, shows that the comparison results are unusable until the directories are fully compared. The second image, with Parallel Full Comparison toggled on, shows that the comparison results are almost instantly accessible, with newly compared files being updated when they are scrolled to. 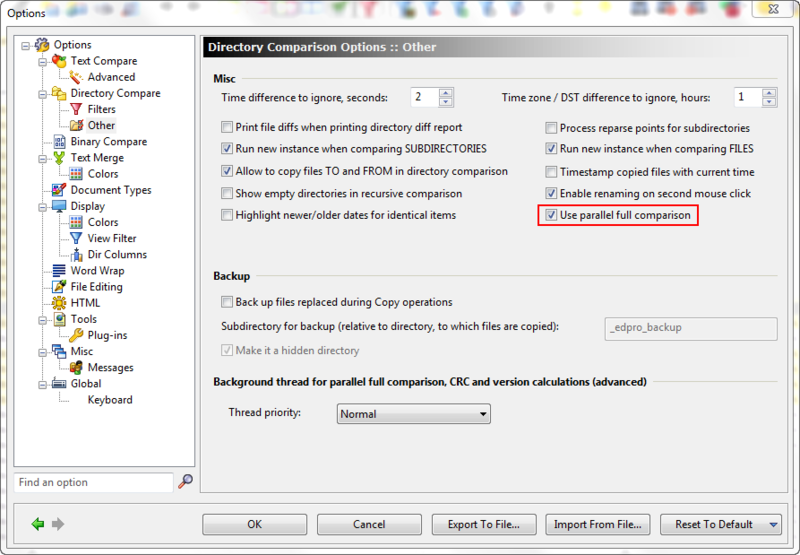 As you can see, Parallel Full Comparison enables greater accessibility and faster utilization of the comparison results.